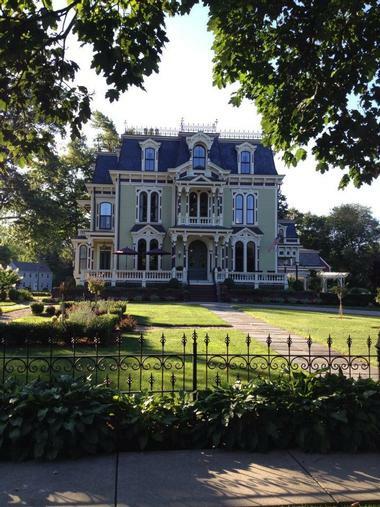 Connecticut is home to many charming inns that provide the perfect base for getting to know nearby towns and cities. Visit Old Saybrook, Norfolk, Mystic, Glastonbury, Greenwich and other beautiful CT destinations. 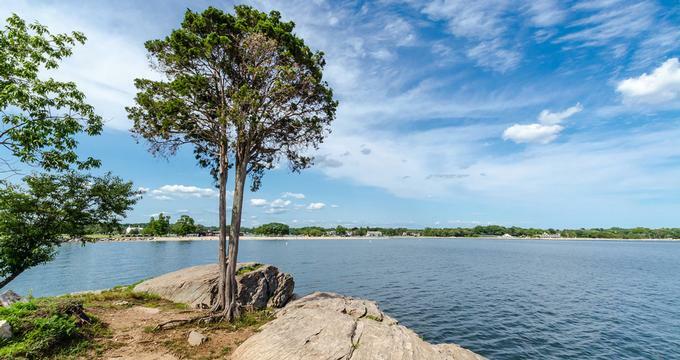 If you are looking for weekend ideas on the East Coast, Connecticut is a beautiful state to explore on your romantic getaway. 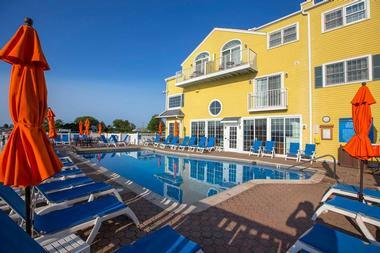 Located directly on the shore of Long Island Sound, the Saybrook Point Inn and Spa is unique among Connecticut vacation spots. The Inn offers over 82 guestrooms in a variety of styles, including regular rooms, villas and guesthouses. This flexibility means this is a great vacation choice for couple’s or a group and regardless of their room choice, guests will enjoy a comfortable environment with breath-taking views. 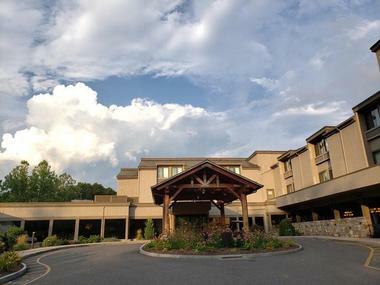 The inn also offers 5-star quality amenities such as an award winning spa, state-of-the-art health club and the charming Fresh Salt restaurant. If you are looking for romantic getaways in CT that accommodate arrival by sea, there is a marina for vessels up to 230 feet. Keep reading below for some of the best best inns in CT. 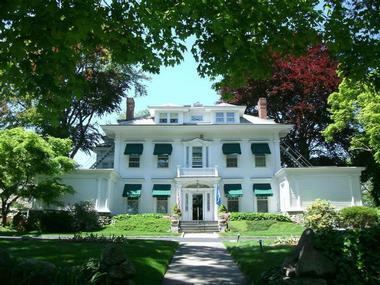 Surrounded by more than six acres of beautiful gardens and lawns and two hundred year old stone walls, Stonecroft Country Inn is a charming bed and breakfast near the lively, quaint town of Mystic, Connecticut, famous for its Seaport and Aquarium as well as Foxwoods and Mohegan Sun casinos. Guests can opt to stay in the 1807 House with four luxurious guest rooms with wide pine plank floors, original features and private baths. Three rooms have fireplaces. The house has four common rooms and six fireplaces. The Yellow Barn, a huge converted post and beam barn, offers six magnificent spacious suites with antique furniture, air-conditioning, fireplaces, widescreen TVs, free Wi-Fi, a whirlpool tub, separate shower, heated towel rack, a coffee maker and an access to the large deck overlooking the gardens. The barn has sitting areas, a dining room and an outdoor terrace. All guests can enjoy the magnificent, well maintained gardens with waterfall and a pond as well as a three-course breakfast served in the dining room or on the terrace overlooking the gardens when weather permits. The Inn at Stonington is a beautiful waterfront 18-room inn located in the historic village of Stonington Borough, Connecticut. Just a short stroll from the lovely Dubois beach, several excellent restaurants, antique shops and galleries, the Inn offers 18 uniquely decorated spacious rooms with luxury linens, balconies, fireplaces, spacious bathrooms with stone tiles and scenic views of the village or Fisher’s Island Sound. 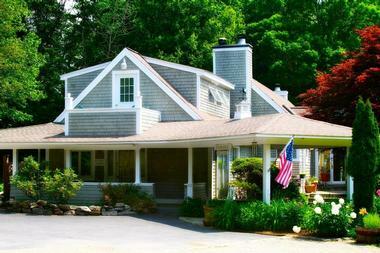 If you are looking for romantic getaways in Connecticut near a beach, this is a great choice. Norfolk is almost fairytale beautiful, with its lovely village green, old bell towers, lovingly restored historic homes, magnificent gardens and quaint winding roads. The Mountain View Inn fits perfectly into this Old World landscape as it is a beautifully restored Victorian surrounded by three acres of picturesque mountainside, seven spectacular rooms and a charming guest house behind the main inn. If you come to Mystic by boat, you can dock it right under your bedroom window. 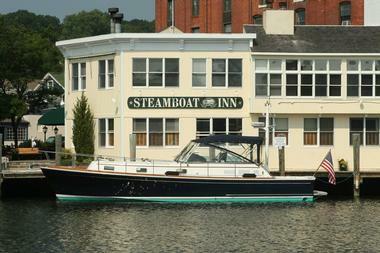 The Steamboat Inn is Mystic’s only waterfront property and has its own spacious dock. This luxurious intimate 11-room Inn is located in the heart of historic Mystic, a walking distance from great restaurants, galleries and antique shops. Not far are Mystic Aquarium, Mystic Seaport and Foxwoods Resort and Casino. The Fitch Claremont Vineyard B&B is a perfect weekend getaway for wine lovers because it is located on a vineyard. 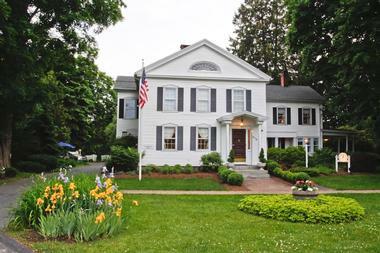 This lovely Connecticut Bed and Breakfast Inn located near Mystic Village, Mohegan Sun and Foxwoods occupies the 1790 Fitch Claremont House, which enjoyed a lively history, transforming from a rustic farmhouse to ‘publick house’ and aristocratic residence. It is surrounded by 30 acres of lush farmland and a working vineyard. A stay in one of the Inn’s four luxurious rooms filled with antiques includes a complimentary bottle of wine, and a sure access to more. All rooms have private baths, air conditioning and a fireplace. Guests are served a full ‘vineyard breakfast’, with freshly baked breads and pastries and other homemade delights. 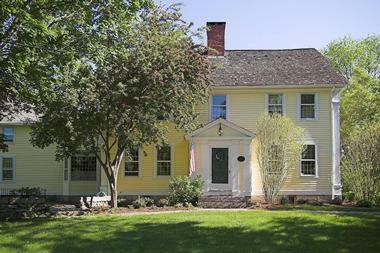 Built at the end of 19th century, The Wallingford is a grand Victorian, a lovingly preserved example of superb craftsmanship with exquisite details such as patterned masonry chimneys, hipped slate roofs with finials, textured shingles and clapboard, intricate, fine reliefs and latticed porches. Filled with antiques and period details, The Wallingford Victorian Inn offers five luxurious suites that will transport you to the more elegant times and offer comfort and amenities of the modern day. Each suite has a cozy sitting area, private luxury bathrooms, cable TV, free wifi, fine linens, iPod players and much more. Complimentary gourmet breakfast is served in the magnificent wood-paneled dining room. The Inn is located in the heart of Wallingford and all the town’s excellent restaurants, shops and galleries are within walking distance. Only a two hour drive or a boat ride from Boston or New York City, where beautiful Niantic River meets the ocean, The Inn at Harbor Hill Marina is perched on a hill overlooking the marina, docks and the river. The Main Inn has 9 guestrooms in a fully restored turn-of-the-century lodging. All rooms have a private bath, beautiful views of the water, cable TV, romantic paddle fans, CD player and air conditioning. Built in 1741, the lovely The Inn at Kent Falls has been meticulously renovated and updated with all modern amenities. The Inn is set in a beautiful, serene environment, surrounded by two and half acres of lush, fragrant gardens with an outdoor pool, a brook and a waterfall. Three luxury suites and three queen size spacious rooms have private baths, cable TV, wireless Internet, fine linens and Aveda bath products. Located on the water’s edge in the scenic Stony Creek village only about 12 miles from New Haven, Thimble Islands Bed & Breakfast is a luxurious, elegant inn, secluded and private and only minutes from beaches, village greens, boat tours, quaint shops, restaurants, vibrant cultural life and abundant nature. 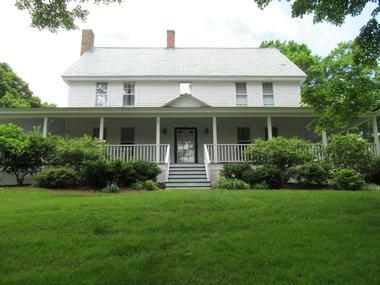 The Bed and Breakfast has two beautiful rooms overlooking the Long Island Sound and picturesque Thimble Islands. 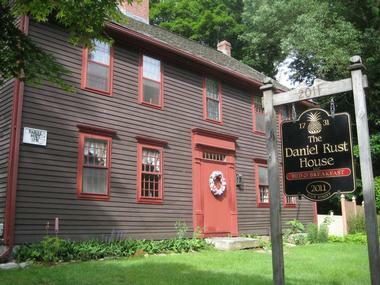 The Daniel Rust House is a piece of Coventry history. Built in 1731 and established in 1800 as a rest house for tired travelers, it continues its tradition with three lovely rooms and a cottage, all furnished and decorated with period antiques from American Colonial times, with air-conditioning, fireplaces, canopy beds and private bathrooms. Built in 1756 for Judge William Noyes, the beautiful Georgian mansion was converted into The Bee and Thistle Inn in 1930 and has been offering serene refuge to guests ever since. Ten luxury rooms are filled with period furnishings, cozy sitting areas, local art, fine linens, opulent private bathrooms and free wifi. Most rooms have antique four-poster beds and some have fireplaces and magnificent views of the Lieutenant River. Snuggled in the heart of a beautiful, forested six acres, secluded and romantic, Abbey's Lantern Hill Inn in Ledyard is only a ten minute drive from historic Mystic as well as Foxwoods Casino. The Inn has six spacious, individually decorated rooms with fireplaces and luxury bathrooms with Jacuzzis, and lovely views. A dog-friendly cottage offers privacy and serenity. Guests can enjoy a game of croquet on the inn’s grounds, grill up some food in the dining pergola and meet fellow travelers while roasting marshmallows over the fire pit. The Inn is a great base for exploring nearby attractions such as 1881 BF Clyde's Cider Mill, Fort Griswold Battlefield & Monument and Mystic Seaport Museum. 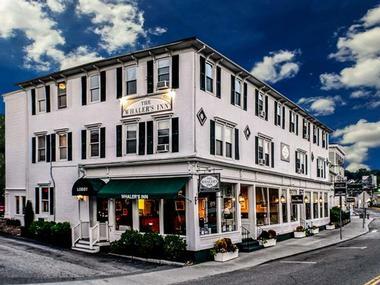 Located in the heart of Historic Downtown Mystic, just half a block from the Historic Bascule Drawbridge and scenic Mystic River, restaurants, shops and the world famous Mystic Seaport Museum of America and the Sea, The Whaler’s Inn is the largest inn in this historic charming village. It has a range of different rooms and suites located in five beautifully maintained Victorian-style houses in downtown Mystic. The rooms are beautifully and uniquely decorated with period touches and have private bathrooms, free wifi and flat-screen TVs. Some rooms feature fireplaces, whirlpool tubs and/or sitting areas. Gourmet continental breakfast is served in the Hoxie House, the main inn building, in a cozy hospitality room. The inn’s own Four-Star Restaurant Bravo Bravo serves excellent Italian food. The Connecticut River Valley Inn is a meticulously renovated historic five bedroom bed and breakfast built in 1740 and located in the heart of Glastonbury's historic district. It sits on a beautifully landscaped two acre property, a few minute walk from the scenic river trail, high quality shops and restaurants. The Inn at Fairfield Beach is an elegant, charming and comfortable lodging located just a few steps from the scenic Connecticut shoreline and beach and a short drive from downtown Fairfield. The Inn has fourteen beautifully appointed suites and studios with individual theme and décor, from safari to nautical. The Deacon Timothy Pratt Bed and Breakfast was built in 1746 and throughout the centuries the original details have been lovingly maintained. 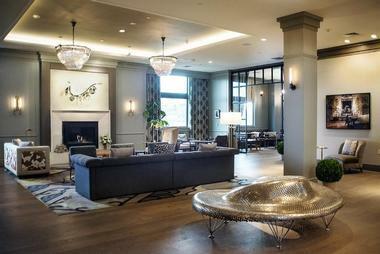 Guests can enjoy hand-hewn beams, wide-board floors and 12 working fireplaces when they visit this piece of Americana. Located just 3 miles north of Historic Mystic, the Old Mystic Inn is a lovely retreat hidden away in Old Mystic, Connecticut. Built in 1784, the inn offers visitors rest and relaxation in a beautifully renovated historic home while still being close to local attractions, shopping and dining. Each of the 8 rooms is decorated in period-appropriate décor and includes original fireplaces. 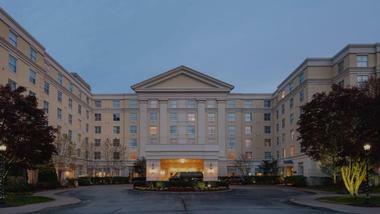 Added modern amenities such as private baths and queen size beds provide guests with a welcome mix of the old and new. Breakfast is prepared by the Inn’s professionally trained chef and served each morning in the Henry Wadsworth Longfellow dining room. Offering two deluxe guestrooms, a suite, a cottage and a carriage house, the Nehemiah Brainerd House Bed and Breakfast has an accommodation to fit every need or want. 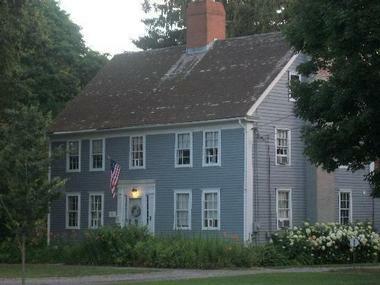 This 18th century home, built in 1765, is located in Middlesex County and both the main house and guest houses are situated in the historic village of Haddam. Travel back in time and enjoy breakfast al fresco on the front porch of the stunning Silas W. Robbins House Bed and Breakfast. This large Victorian home has been meticulously and lovingly restored to allow visitors the chance to stay in an inn that is both stately and elegant. The Tolland Inn is a hidden gem nestled in the pleasant town of Tolland. It is ideally located for visiting Sturbridge Village and the New England Air Museum and is often the chosen accommodation for those visiting the University of Connecticut. Offering 3 large and spacious guest rooms, as well as 3 delightfully furnished suites, this inn is charming and homey. A getaway on a working family-owned farm is just what guests will experience at the B&B at Bartlett Farm. The Bartlett family has owned the farmhouse since it was built around 1784 and today share it with guests while also maintaining the small farm throughout the year. 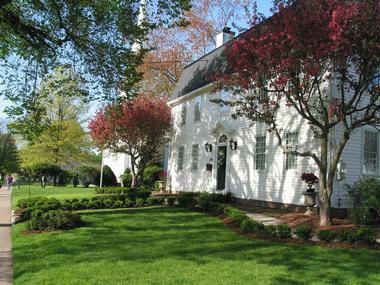 Located in one of Connecticut’s oldest town, Guilford, the bed and breakfast offers guests one of 3 rooms, all with private baths and in-room television. Wireless Internet is available throughout the house. Rates include breakfast served daily and often made with produce and ingredients raised on the farm itself. The Mansion Inn Bed and Breakfast is located in the center of Connecticut, and offers guests the chance to sleep in a historic home steeped in the history of some of America’s greatest artists. This mansion was originally home to a Connecticut family that enjoyed a close friendship with Mark Twain’s family and lived alongside Harriet Beecher Stowe. The Scranton Seahorse Inn offers guests the choice of 7 tranquilly-appointed rooms, each with a private bath. This Greek revival home was originally built in 1833 and provides visitors with the opportunity to enjoy a charming piece of New England history while still being close to locally owned, specialty boutiques, independent restaurants and, of course, the sea shore. Built in 1850, the Stanton House Inn, was a private residence for over 100 years. Offering 20 individually decorated rooms and suites, the Stanton House now mixes historical details with modern comforts and amenities. Located in romantic Greenwich, the inn’s location is perfect for a rural getaway. Visitors may enjoy afternoon tea in the formal dining room or relax with a good book in the parlor. Complimentary breakfast is served seasonally in the dining room or on the open-air patio. If visiting in the winter, guests can warm up by one of the common area fireplaces and summer visitors can take a dip in the pool to cool off.